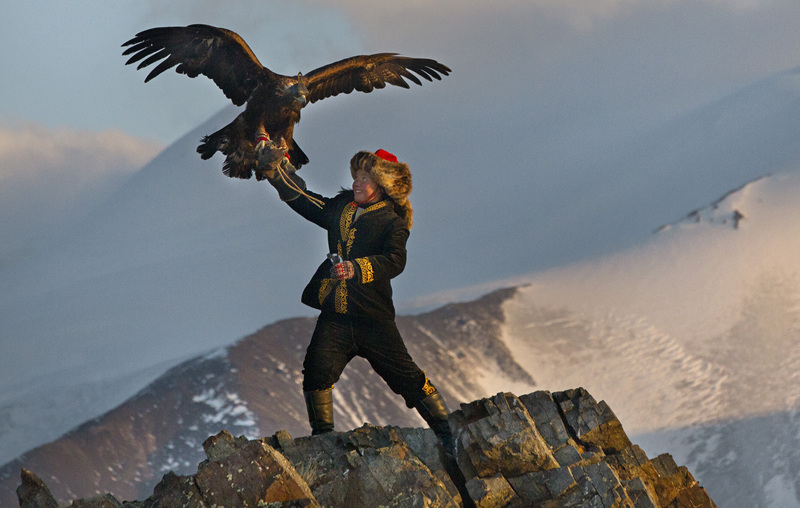 A documentary has flown in just when parents of little girls are looking for ways to reaffirm their power, and its name is THE EAGLE HUNTRESS. The movie follows Aisholpan, a 13 year old nomadic child who lives in the Altai Mountains in Central and East Asia, who decides she wants to become an eagle hunter like her father and those before him. The women of her people are not accepted as eagle hunters, and no woman in her family has ever learned to master the skill. Many of the old guard of Kazakh eagle hunters reject the notion that any female should take part in the tradition, but Aisholpan is determined and steadfast in her desire to fulfill her dream. Eagle hunting has been used for centuries by her people, the Kazakhs, to kill small animals like rabbits and marmots for food, and foxes for furs to keep warm. In 2016 they don’t need to do so, because the animals are hunted with guns, but the tradition continues, for cultural and nationalistic reasons, although in ancient times the hunting had religious, spiritual, or shamanistic aspects. There were and still are gorgeous and colorful equipment and costume, including decorated leather arm coverings as protection from the eagle talons, and robes in which to stay warm during the hunt. It takes a fierce strength and fearlessness to not only train and partner with their birds, but also to go out into the wilderness for weeks to hunt. Director Otto Bell tells an exceedingly linear and straight ahead story, but with a clear eye towards exposing the joy and commitment of this rule-breaking, stereotype-busting young lady. We as the audience get to see her learn at the right hand of her father and master eagle hunter Nurgaiv, and be supported by her strong, hardworking mother Almagul. We also see her both compete at the annual festival in Olgii and go out into the dangerous wilds of the Mongolian steppe in 40 below zero temperatures to hunt with her golden eagle for the first time. While Bell has been criticized for manipulating the filming of Aisholpan’s journey and experience, the challenges are still the same, and the inspiring nature of both Aisholpan’s hard work and her unflagging determination are authentic enough to make the film a great opportunity for role modeling, and for families to watch together. The landscape, as well, is spectacular, especially for those who love nature and our continued connectedness to it.